Sandy (cat 3): Late October 2012. Sandy made landfall with the East coast near Atlantic City NJ. Blue Note was again at the Liberty Landing Marina. At first I was in denial that a second hurricane was going to affect Blue Note in two years in row. This time I decided to prepare the boat but stay at home in West NJ since from my previous year experience I had realized that there was not much I could have done while staying on the boat. Sandy hit NJ at night and I spent all night following the news. The wind in central NJ was exceptionally strong and I could hear many trees falling. On the news I was following the reporter for the Weather Channel who was broadcasting from Battery Park in NYC just across from the Liberty Landing Marina. At the same time I was also checking the data from the buoy at Battery park. When the peak of the surge happen the Weather Channel reporter mentioned that the water was 1.5 feet higher than during Irene. Because knowing that during Irene at peak of the surge there was still 2-2.5 feet left to the top of the piling, I had reason to believe that Blue Note would have been OK. At sun rise I decided to go check on Blue Note and left the house. It took me 3 hours and the use of a chain saw to open my way through all the fallen trees and reach the highway that is only 4 miles away from the house. The drive to the marina, 50 miles away, was fast with no one on the road. When I got to the Liberty State Park the road to the marina was flooded and a sailboat was right in the middle (photo). I parked the car at the parking lot of the Path that is at higher elevation. From there I walked in about one foot deep water towards the marina. The first things I saw was the destruction of the boats that have been hauled out and put on stand (generally this is considered the safest place for boats during an hurricane). The area where the boast were on the stands was flooded and the boat were piled against the trees and the highway (photos). After passing the disaster of the boats than were hauled out, I start to walk from the R-dock toward the C-dock where Blue Note was. All boats on the floating dock looked OK with only few of them with the head sail shredded by the high wind (photos). I finally reached the C-Dock and found Blue Note surrounded by a sea of debris (photos). I did a quick survey and found only minor damage: a large barrel got wedge between Blue Note and the dock causing some scratch on the gel coat. One of the cup holders in the cockpit had flown away. The plastic nose of the wind generator had a small crack. Overall no much damage but a huge scare. Unfortunately many boats (65,000 recreational boats according to BoatUS report) in the US were much less lucky than Blue Note. Sean (Tropical Storm): November 2011. We left NYC for St. Thomas with a favorable wind from the North we and kept a course parallel to the coast. 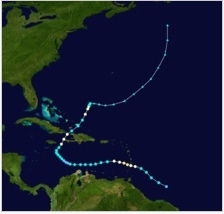 On Nov. 8 Sean developed into a Tropical storm with winds up to 40 kt and the prediction for Sean at the time were to rapidly move East-North-East. But Sean instead decided to linger around 30N 70W right on the rhumb line of Blue Note for St. Thomas. So we had to deviate West and make sure we always stay at a safe distance. On the evening of Nov. 9 Sean finally accelerate north and we started to go back on the rhumb line for St. Thomas. For several days the wind was around 20 to 30 kts but the sea never too big. Track of Blue Note and Sean. 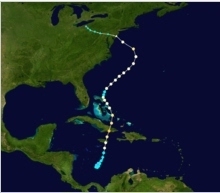 Irene (Cat 3): Late August 2011. 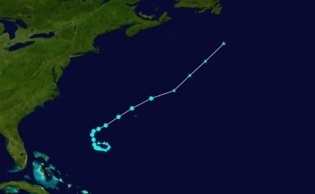 Irene made landfall with the East coast of the US several time and the final landfall was in Brooklyn. Blue Note was at the Liberty Landing marina on a floating dock. I was very worried about Blue Note and the idea to be far away from her was too much that I decided to ignore the mandatory evacuation of Liberty State Park and surrounding area and stayed on the boat. The wind never got too strong (did not had the instruments on, but I’m guessing wind gust only up to 40 kts.) The worry with been at a floating dock was that the surge would have been higher than the height of the piling. At the peak there was still 2-2.5 feet left. No major damage occurred to the New York area and no damage to Blue Note or to other boats at the marina. Tomas (Cat 2): October/November 2010. 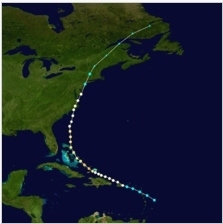 Tomas was a Cat 1 Hurricane when we left NYC for St. Thomas. His path was not well defined and we decided to leave but follow the cost closely and dock at Little Creek right at the beginning of the Chesapeake bay. We spent few days there and when we had conformation that Tomas was rapidly moving east and dissipating we continue for St. Thomas. After the crossing the Gulf Steam we encountered gale force wind (40-50 kts, see videos) but that wind had nothing to do with Tomas and was due to a low pressure moving north.